Last week, Ragnarok happened twice: according to the Vikings, the 22nd was their predicted world-reset-day, and the 19th saw the release of Loki: Ragnarock and Roll. Luckily for us, only the latter occurred. 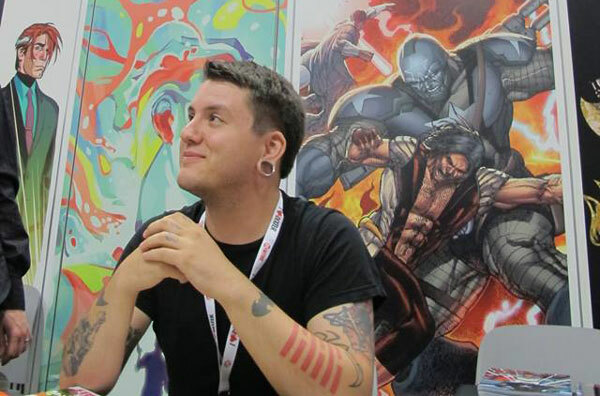 We chatted with author Eric Esquivel about his take on Norse mythology as well as his upcoming work. My first question would definitely have to be: where did the title Thunderchrist come from? 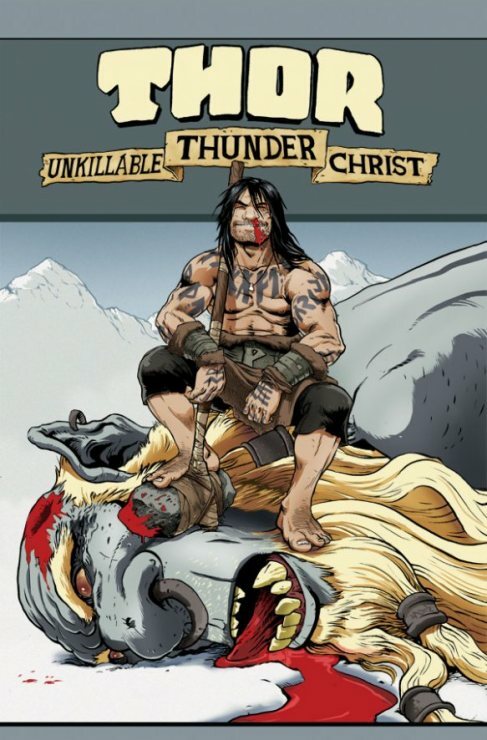 EE: Thor: Unkillable Thunder Christ was a book that I put out a year, maybe two years ago, wherein Thor (the Norse God of bludgeoning things to death with a hammer) came to Earth, encountered the Jesus story and decided that a God ought to fight for his people, not die for them. It was a fun little one-shot that I used as my “demo tape” to get into mainstream comics–and it worked! I have a similar book comin’ out this February called Loki: Ragnarok and Roll, which is about Thor’s half-brother, Loki, The Lord of Lies, forming a metal band on Earth. Did you get a lot of flak for comparing Thor to Jesus? EE: A bit, yeah–but I knew that going in. Honestly, the worst of it all was that the publisher, Moonstone Books, refused to put the thing up on Comixology (the world’s biggest online marketplace for digital comics), because he didn’t want it floating there next to his other comics, tarnishing the brand. The irony of my having written for four issues of his monthly Zombies Vs. Cheerleaders anthology–which is apparently family fun for all ages, denominations and creeds–did not escape me in the slightest. Thankfully, the title grabbed a lot of attention. Most notably, Akira The Don (a popular U.K. “nerdcore” rapper) named his record after it. In regards to Loki: Ragnarock and Roll, especially with the Marvel movies being very Loki-centric, was it difficult to write a story that distances itself from the movies and peoples’ schemas of Loki? EE: The Marvel stuff is great–both the comics and the films–but Loki doesn’t just predate Marvel, he predates the English language. There’s lot of source material our there to crib from. In this upcoming series, Loki joins a rock band; how did you decide what type of band he would join? Why rock instead of something like pop or jazz? EE: The reason Loki joins a metal band and not a synth pop quartet is because there’s a trickstery energy to metal that you just don’t find in other genres. It’s aggressive, it’s anti-establishment, and–most importantly–it’s transformative. Squares look at Metal and see only death. Metal Heads see rebirth. What kind of band would Thor join? And what is Loki’s guitar of choice? EE: Thor is too concerned with how people perceive him to ever create an original work of art. He’d be more comfortable as a critic, or an editor–someone who makes a living critiquing other peoples’ honest personal expressions instead of offering any of their own. If forced, he’d join a cover band of whatever is the most popular at the moment. As for Loki’s guitar: any old axe’ll do. It’s important to him that people don’t confuse their value with tools. He’s want his fans to know that you don’t need a billion dollar, custom rig in order to rock any more than you need an fancy schmancy, enchanted hammer to be a hero. 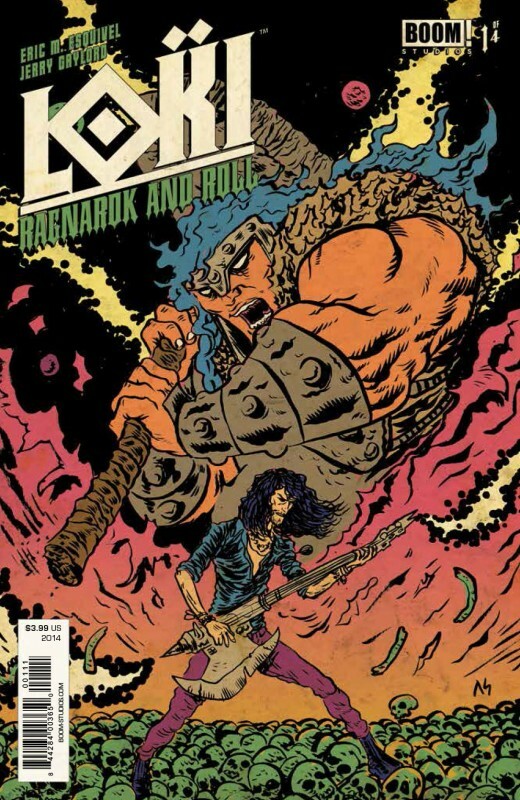 Who was your target audience when writing Loki: Ragnarock and Roll? EE: Loki: Ragnarok and Roll is for everyone who knows how it feels to be plugged into a social paradigm that serves everyone but them. It’s for folks who know that there’s more to life than being their father’s favorite son, getting on the honor roll, and working themselves into exhaustion for a meaningless “Employee Of The Month” pat on the head. It’s for those of us who weren’t born with a silver spoon in our mouths and an enchanted hammer in our hands–and who recognize how much of a gift that is. Your Thor and Loki comics are definitely for young adults, but you also write for Adventure Time and Bravest Warriors, which are primarily for kids. Was it difficult to go from writing about adult themes to childlike ones? EE: That’s an excellent question! The answer is: not really. I think, just for sanity’s sake, us adults try to pretend that our problems are way more complex than our kids’…but the simple fact of the matter is that that’s impossible. You have to remember; when you’re a kid you’re dealing with all of the horrors of life for the very first time. You don’t have any reference points for anything. In terms of your own personal mythology, getting separated from your mom in Target for five minutes is as devastating as the bottom of the second act of The Empire Strikes Back. Writing for adults is fun ’cause you go really, really Michael-Bay-level big with your set pieces. Writing for kids is great because you don’t have to. Based on the previews, Dark Queen appears to combine a lot of mythological figures with modern elements (such as the Internet). EE: Yeah! Grimm Fairy Tales: Dark Queen was a fun gig, ’cause I got to take the woman who is essentially the inspiration for all of the Disney princess big bads and transport her to the modern era, where gets to see that her legacy of brutality has been re-appropriated, remixed and sanitized for use as children’s bedtime fairy tales. The whole thing is about the power of fables, and how sometimes the stories we tell each other to get through the day are more important than truth. For Grimm Fairy Tales, how did you decide which elements of the modern world you would incorporate into the story? EE: Like Cthulhu or The Mainstream Media, The Dark Queen is an ancient monster fueled by negativity. She’s strongest when human beings are locked into a self-fulfilling prophecy of doom and gloom–so of course she’d be interested in the whiny “social justice” side of social media, the potential of Instagram to “filter” our perception of the world around us, the hypnotic powers of television shows like BREAKING BAD and DEXTER that compel us to root for evildoers, etc. If you were a Big Bad who wanted to poison the hearts and minds of humanity, this would be the best time in history to go for it. Do you prefer writing your own characters or characters established by others? EE: I know it’s a cheap answer, but: I honestly don’t feel creatively fulfilled unless I’m doing both simultaneously. It’s important to me that I do my part in preserving the legends I loved a kid, but I also need to feel like I’m pulling my weight as an author, and throwing new characters into the mix for other young weirdos to play with when I’m dead and gone. Which character do you feel like you identify with the most (whether your own creation or another)? EE: Loki. Hands down. No question. He knows how to talk pretty and influence crowds, but he’s terrible with interpersonal relationships. Plus, y’know, handsome. It’s like looking into a mirror.